This is the second series of Go Green. It was actually served with dashi miso broth, wakame, tofo, chrysanthemum greens (other names: garland chrysanthemum, edible chrysanthemum, tong ho), lo bak (other names: Japanese daikon, Japanese/Chinese radish), and green onion. 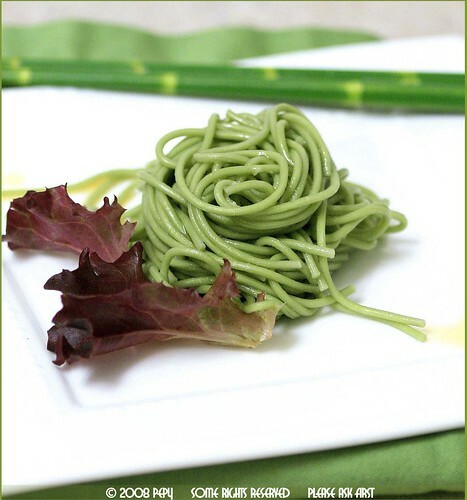 Since I wanted to take several shots of matcha soba, the soba was just undercooked and mixed with sesame-soy oil. 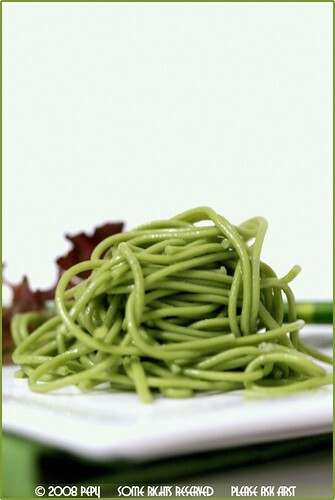 Pep, matcha soba-nya bikin sendiri? gak itu beli jadi kering tgl rebus.kok gitu? soalnya kl aku buka baik2 aja. aku dpt pop up kl buka blognya mbak Arfi. Very healthy indeed. Looks great! gak itu beli jadi kering tgl rebus. kok gitu? soalnya kl aku buka baik2 aja. aku dpt pop up kl buka blognya mbak Arfi. so simple & light, so nice. Just the food I need when I want to eat light yet delicious meals. Love the photography too. LCOM: Thanks.Noobcook: Indeed and thanks. Wow nice color and looks simple and delicious. Your food photography is just so beautiful and delcious! It makes me want to learn so much more about wonderful indonesian food. I have so much more to learn from you!